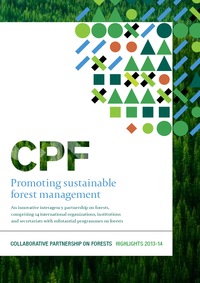 The Collaborative Partnership on Forests (CPF) is an informal, voluntary arrangement among 15 international organizations and secretariats with substantial programmes on forests. These agencies share their experiences and build on them to produce new benefits for their respective constituencies. They collaborate to streamline and align their work and to find ways of improving forest management and conservation and the production and trade of forest products. The members are also forming increasingly close and valuable strategic partnerships with one another, benefiting from shared expertise and pooled resources. The mission of the Collaborative Partnership on Forests is to promote sustainable management of all types of forests and to strengthen long-term political commitment to this end. The objectives of the Collaborative Partnership on Forests are to support the work of UNFF and its member countries and to enhance cooperation and coordination on forest issues. The UN Economic and Social Council (ECOSOC) in its Resolution 2000/35 invited the heads of relevant UN, international and regional bodies to form a collaborative partnership on forests. The CPF was established in April 2001. The CPF is chaired by FAO and is serviced by the UNFF Secretariat. The CPF usually convenes to discuss strategic areas of coordination between CPF members and to work towards a better coherence between countries, in conjunction with major events; to keep travel costs low and make efficient use of staff time. The Collaborative Partnership on Forests Framework, produced annually, represents the Partnership's work plan and its progress report.